KOREA TOUR CARD, Tmoney and Cashbee are transportation cards that can be used on public buses and subways in several different metropolitan cities and locations throughout the nation. With this transportation card, travelers can save the hassle of purchasing single journey subway tickets for every ride and enjoy discounts on rides during transfers from one bus to another, one subway line to another, or from bus to subway or vice versa (within a transfer time limit). Tmoney card can be divided into a basic Tmoney card, integrated cards, foreigner exclusive cards, customized card, and mobile Tmoney. Tmoney cards can be used as a transportation card as well as a method of payment at affiliated stores. 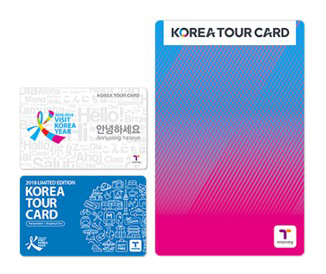 KOREA TOUR CARD is equipped with Tmoney functions and offers discount benefits on shopping, attractions, performances, and hallyu related contents. Cashbee card also functions as a transportation card and a method of payment at affiliated shopping centers and convenience stores. Among the many different types of Cashbee cards, Cashbee Jeju Pass Card is recommended to visitors traveling to Jeju Island as it offers discount benefits at tour attractions and duty free shops in Jeju Island. 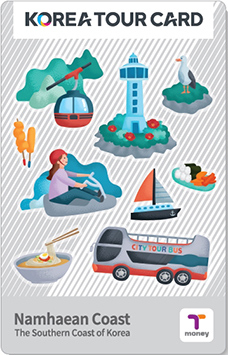 KOREA TOUR CARD is a useful transportation and travel card exclusive to international tourists. 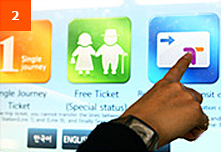 The card provides convenient access to public transportation anywhere in Korea. KOREA TOUR CARD also provides discount benefits at popular attractions such as National Museum of Modern and Contemporary Art, Seoul, Everland, and Lotte World. The card is also downloadable via mobile app of the same name, allowing convenient access to all the benefits of the KOREA TOUR CARD without the hassle of carrying a physical card in your wallet. 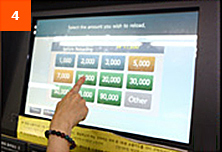 Convenience stores and Tmoney service desks at subway stations (Seoul Subway Lines 1-8, Incheon Subway Lines 1-2) and at Woori bank currency exchange booths at the Arrival Gate within Incheon International Airport and Gimpo International Airport. * Cards can also be reloaded using the card reloading devices within subway stations. * Upon refund, travelers can receive the remaining balance loaded in the card with a service charge of 500 won; card purchase payment will not be refunded. Cardholders are advised to load their card in small amounts as refund process for over 50,000 won can be complicated and time-consuming. In addition to all the regular KOREA TOUR CARD benefits, the KOREA TOUR CARD Namhaean Coast comes with special privileges that are unique to the Namhaean (southern coast) regions of Busan, Gyeongsangnam-do, and Jeollanam-do. KOREA TOUR CARD Namhaen Coast cardholders will not only be eligible for 170 various benefits of a regular KOREA TOUR CARD, but will also be rewarded with over 30 exclusive special benefits only available in the southern coast regions. KOREA TOUR CARD Namhaean Coast is currently not for sale but expected to be available in stores later this year. * Cashbee card is not accepted in Gyeongsangbuk-do (Andong), Gyeongsangnam-do (Geoje, Tongyeong, Hadong, Hapcheon, Hamyang, Geochang, Changnyeong, Goseong, Sancheong, Namhae). Convenience stores (GS25, CU, 7-Eleven, Ministop, Buy The Way, etc.) bearing the Tmoney or Cashbee logo in areas of use listed above. * Card price and service fee of 500 won are not refundable. Travelers are advised to load their card in small amounts as the refund process for over 50,000 won can be complicated and time-consuming. 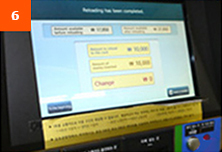 When used with public transportation in Seoul, you must tap your card when boarding and getting off buses or entering and exiting subway stations. Transfer discounts are also available, limited to four times a day, within a transfer time limit of 30 minutes (up to 1 hour from 21:00 to 07:00 next day). However, the transfer discount will not apply if transferring to the same numbered bus or re-entering the same subway station within 30 minutes. Upon boarding the bus, place your card on the sensor located at the front of the bus until it beeps. The sensor will display the amount charged on the top and the remaining balance at the bottom. Before getting off the bus, place the transportation card on the sensor located at the rear doors of the bus until it beeps. If you do not tap your card before getting off the bus, you will not be able to benefit from the transfer discount. Place your card on the sensor located on top of the subway turnstile until it beeps. The sensor will display the amount charged on the top and the remaining balance at the bottom. If you are transferring, the amount charge may appear as “0” (zero). Upon arriving at your destination, tap your card at the sensor on the turnstile again in order to exit. In a taxi with the Tmoney or Cashbee logo affixed, inform the taxi driver that you want to pay with a transportation card, tap your card on the terminal, and your taxi fare will be automatically paid from your transportation card’s balance. However, please note that this payment method will only work if there is enough balance on your card to pay the full fare. 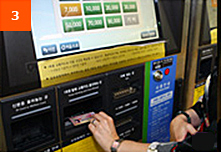 * To use the subway with cash, purchase a single journey ticket from the ticket vending machines. The fare will depend on the final destination, in addition to a 500 won deposit. 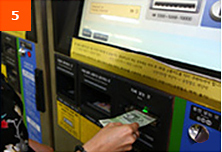 The deposit can be obtained by returning the card to a Card Refund Deposit machine after exiting at the final station. 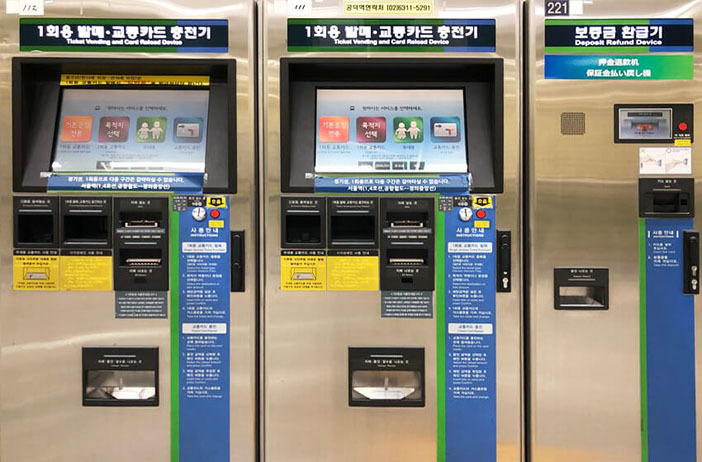 * Distances under 10 km by subway are base fare, with an additional 100 won charged for each 5 km increment from 10-50 km, and 100 won additional for each 8km increment over 50 km. can hold is 500,000 won) at any sales locations or the card reload devices inside subway stations. throughout the country. / Cashbee cards can be charged within subway stations in the Seoul Metropolitan area and Busan. 1) Select your preferred language (Korean, English, Japanese, Chinese). 2) Touch the “Reloading the transit card” button. 3) Place your card on the loading pad. 4) Select the amount of money you wish to load. 6) Wait briefly while the device reloads your Tmoney card. Once reloading is complete, confirm its balance. This page was last updated on April 18, 2019, and therefore information may differ from what is presented here.